Carmela is a truly one-of-a-kind! A delicately pleated halter bodice is paired nicely with cold-shoulder sleeves. 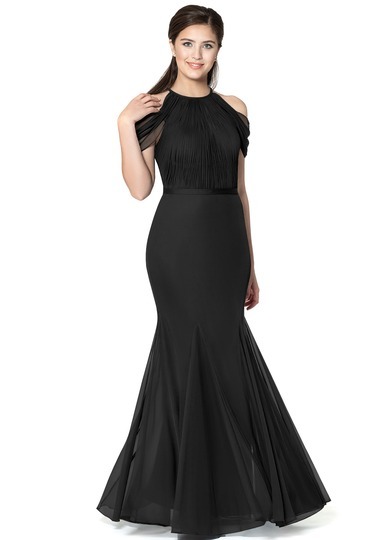 A feminine mermaid silhouette with godets adds an airy yet voluminous touch to the whole dress, making it the perfect dress to dance the night away in! I ordered the sample of Carmela in a size 2. I am 5'2" and usually between a size 0-2 in pants/dresses and a size 2-4 in formal wear. This dress is SO comfortable! I thought that because it was form fitting it would be restrictive but the fabric is so light and stretchy. For comfort I think I will order a size 2 or custom order. The dress look beautiful on and I actually look forward to wearing this on the day of the event. I will say, that if you want the bottom to flair out as much as the photo, you may want to consider getting a crinoline slip for added volume. However it still looks great without it! very unhappy maid of honor. I loved the dress in the picture, but wow it’s so unflattering in person. The belt that should be at the waistline falls on my hips and makes me look like I have such an odd shape. It’s also barely even stitched on and is falling off. The dress is way bigger than the size I got. Now I have to pay a bunch of money to get everything on the dress changed and altered and pray it works because there’s not enough time to get a new one. I landed between two sizes so I ordered the larger size to accomodate my bust. When I tried this dress on it was huge. My recommendation is to order down a size if you are in this predicament. This dress appears to be cut more mermaid then it actually is. It is also very long for all my short people. The dress is not silky like the picture. I t is very long! The arm part was very lovely but the measurements did not correlate with the dress. Ordered 6 dresses to try on - they showed up in no time (maybe about 5 days.) I really thought they all were nice but this one was my favorite ! Very fitted, loved the material, it reminded me of Belle from Beauty and the Beast but with a mermaid fit.